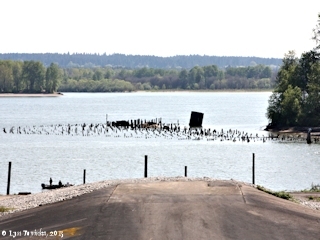 Click image to enlarge Multnomah Channel from the Sauvie Island Bridge. 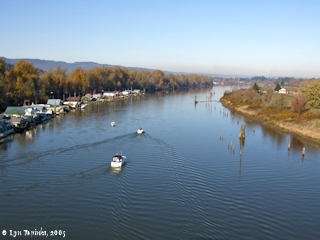 View is looking downstream with Oregon mainland on the left and Sauvie Island on the right. Image taken November 20, 2005. 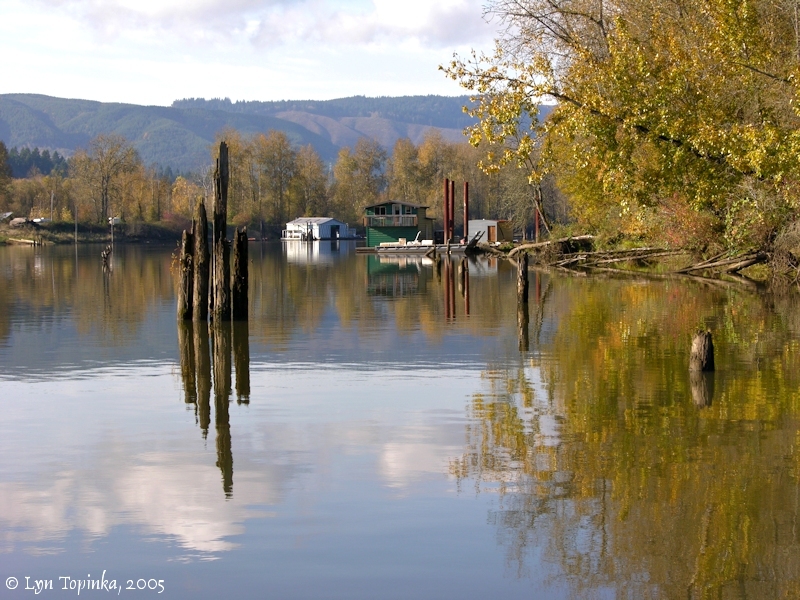 The 21-mile-long Multnomah Channel forms the western shore of Sauvie Island, with its mouth (downstream end) on the Oregon side of the Columbia River at River Mile (RM) 86.5, and its head branching from the Willamette River at RM 3.5. 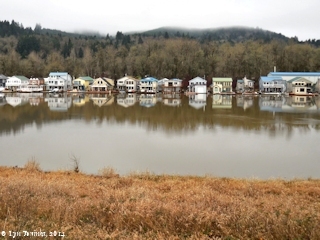 Today the community of St. Helens is located on the Oregon shore where the Multnomah Channel merges with the Columbia River. The Tualatin Mountains rise above the southeastern half of the Multnomah Channel and Sauvie Island. 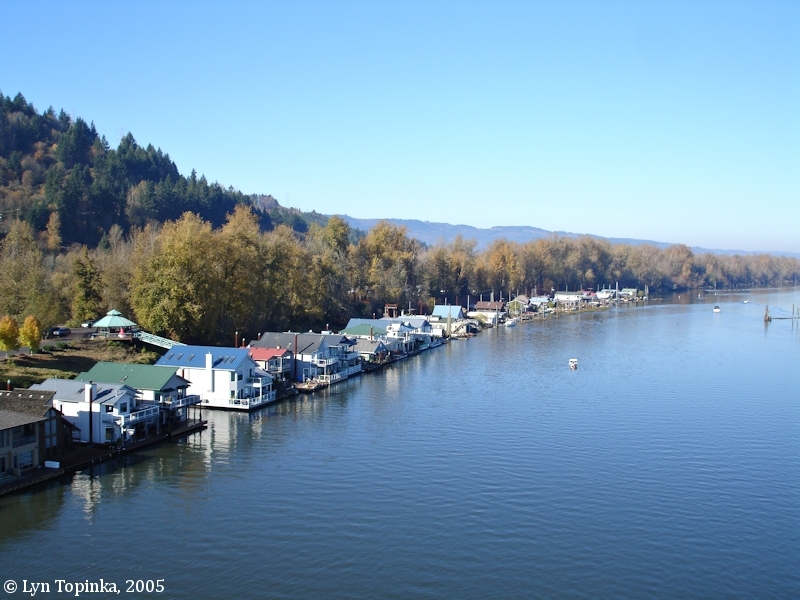 According to the State of Oregon's "Blue Book", the name "Multnomah" is derived from "nematlnomaq", probably meaning "downriver". Lewis and Clark made note of the Indian village of Multnomah on Sauvie Island in 1805, and applied that name to all local Indians. Lewis and Clark passed the mouth of the Multnomah Channel on November 5, 1805. On Lewis and Clark's return in March 1806 and called the Channel "Wappato Inlet". The upstream end of the Multnomah Channel is on the Willamette River at River Mile (RM) 3.5. Captain Clark passed this upper end of the channel on April 2, 1806, as he explored the lower reaches of the Willamette River, reaching as far upstream as the Oregon community of St. Johns. 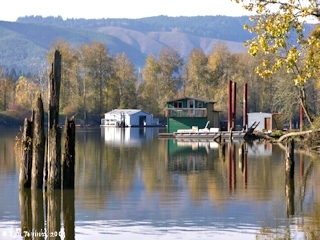 Clark referred to the Multnomah Channel as a "Sluce" which separated "Wappato island" (Sauvie Island) from the mainland of Oregon. In 1792 Lieutenant Broughton of the Captain George Vancouver Expedition passed by the downstream end of the Multnomah Channel on October 28, 1792, and called the channel "Call's River", apparently after Sir John Call. Lewis and Clark pass the mouth of the Multnomah Channel on November 5, 1805, and on their return on March 29, 1806, they refer to the Channel as "Wappato Inlet". On April 2, 1806, Captain Clark passes the head of Multnomah Channel as he explores the Willamette River (see above). In 1841 Charles Wilkes and the U.S. Exploring Expedition used "Warrior Branch" because the channel joined the Columbia River at Warrior Point on Sauvie Island. The 1858 "Report, The Superintendant of the Coast Survey Showing the Progress of the Survey During the Year 1858", U.S. Senate, calls the Multnomah Channel the "Warrior branch or slough of the Willamette" and states it is 2 miles long. The "Multnomah island" is today's Sauvie Island. "... From the Cowlitz the next course of the Columbia is SE. 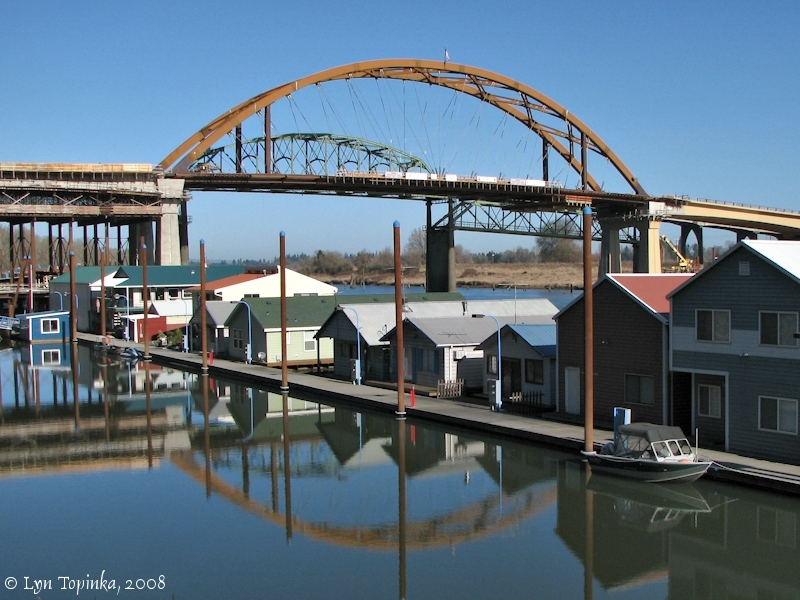 2/3 S. for 27 miles to the mouth of the Willamette river, about 16 miles above the Cowlitz. The Warrior branch or slough of the river makes in from the west side and runs around Multnomah island, coming into the Willamette two miles above its mouth. 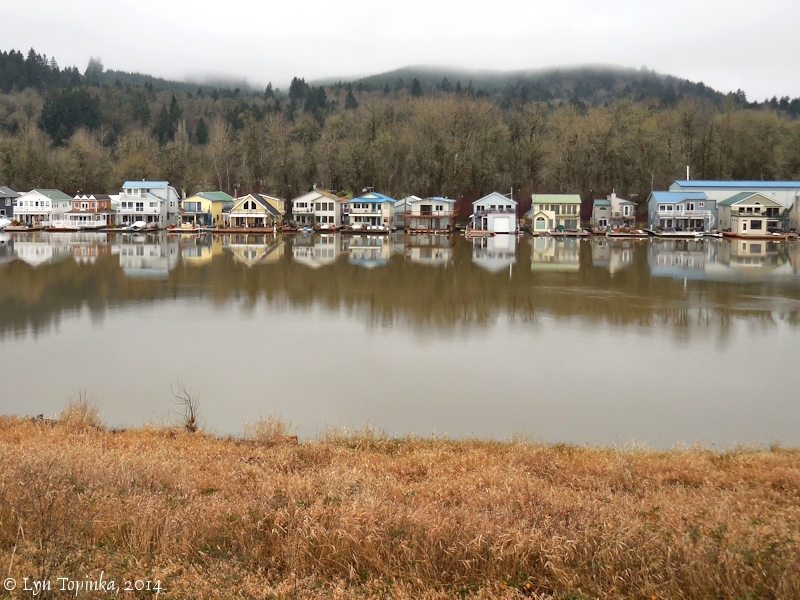 ..."
The channel also went by the name "Willamette Slough". In 1913 the U.S. Board of Geographic Names made offical "Multnomah Channel". Click image to enlarge Multnomah Channel. View from Sauvie Island looking across to the Oregon mainland. The Multnomah Channel flows down the western side of Sauvie Island, and connects the Willamette River to the Columbia River. Image taken November 8, 2005. 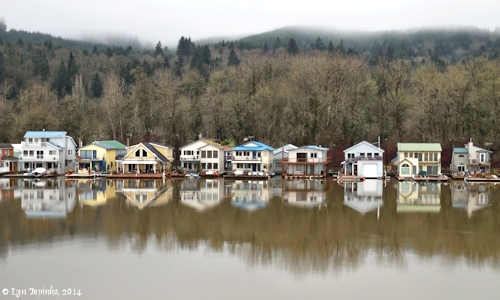 Click image to enlarge Multnomah Channel homes as seen from Sauvie Island, Oregon. The Multnomah Channel flows down the western side of Sauvie Island, and connects the Willamette River to the Columbia River. Image taken December 13, 2014. 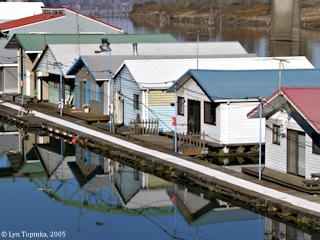 Click image to enlarge Multnomah Channel homes near the Sauvie Island Bridge. Image taken November 20, 2005. 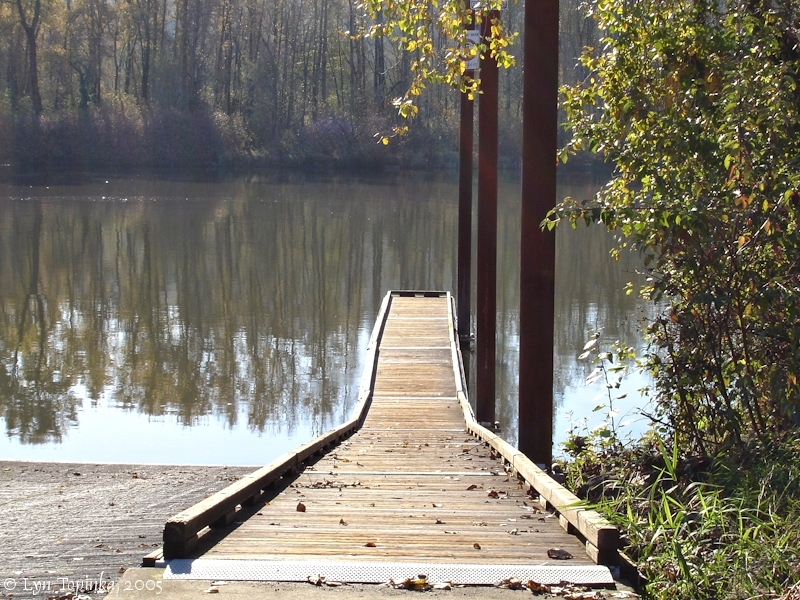 Sauvie Island Boat Ramp, on Multnomah Channel, is a Portland Metro Park, a boat ramp, and picnic area on the west side of Sauvie Island. 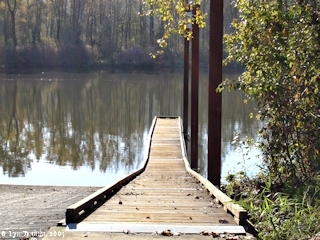 Click image to enlarge Sauvie Island Boat Ramp on Multnomah Channel, Sauvie Island, Oregon. Image taken November 8, 2005. 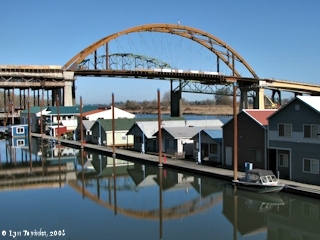 In 1950 the Sauvie Island Bridge was constructed across Multnomah Channel, linking Sauvie Island with mainland Oregon. The replacement bridge is scheduled to open in 2008. Scappoose Bay is a side-channel to Multnomah Channel and merges with the channel approximately one mile before Multnomah Channel merges with the Columbia River. 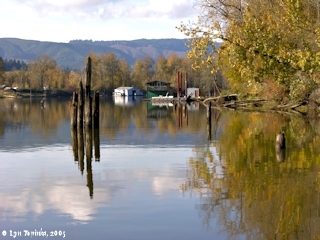 The Oregon community of St. Helens is situated in the Scappoose Bay watershed. 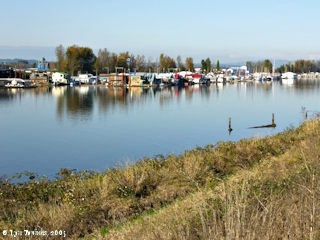 Click image to enlarge Marina at Scappoose Bay, Oregon. Mount Adams, Washington, is in the distance. Image taken August 29, 2004. Click image to enlarge Mouth of the Multnomah Channel as it merges into the Columbia River. View from St. Helens, Oregon, looking at the mouth of the Multnomah Channel. Warrier Point, Sauvie Island, is on the right and the Washington shore is across the Columbia. Image taken April 20, 2015.